On January 12, 2015, one day after the Broncos' loss to the Indianapolis Colts in the Divisional round of the 2014 playoffs, the Broncos and head coach John Fox decided to mutually part ways. Fox compiled a 49–22 record in four seasons (including the playoffs), led the Broncos to four consecutive AFC West division titles, a first-round bye in three consecutive seasons as well as a berth in Super Bowl XLVIII, but lost in the Divisional round of the playoffs in three of his four seasons as head coach. Fox departed with a .719 winning percentage in his four seasons as head coach — the highest in franchise history. Four days later (January 16), Fox was hired as the new head coach of the Chicago Bears. The Broncos traded their original first-round selection (No. 28 overall), one of their two fifth-round selections (No. 143 overall — previously acquired as part of a trade with the Chicago Bears during the 2014 draft), a 2016 fifth-round selection and guard/center Manny Ramirez to the Detroit Lions in exchange for the Lions' first-round selection (No. 23 overall). The Broncos traded their original fourth-round selection (No. 126 overall), along with their 2014 second- and fifth-round selections to the San Francisco 49ers in exchange for the 49ers' 2014 second- and seventh-round selections. The Broncos traded their original seventh-round selection (No. 245 overall) to the New York Giants in exchange for placekicker Brandon McManus. This marked the first time since September 17, 2006, that the Broncos won a game without scoring an offensive touchdown. Peyton Manning failed to throw a touchdown pass in a season opener for the first time since 2003. The Broncos won their 11th consecutive game against the Browns, dating back to the 1991 season, and improved their all-time series record against the Browns to 23–5 (including the playoffs). Owner Pat Bowlen was inducted into the Broncos' Ring of Fame during halftime. Due to his battle with Alzheimer's disease, Bowlen relinquished control of the team to team president Joe Ellis and executive vice president/general manager John Elway prior to the start of the 2014 season. The Broncos' defense limited Aaron Rodgers to just 77 yards passing — the lowest of Rodgers' career in a game where he wasn't knocked out by injury. The Broncos started 7–0 for only the second time in franchise history, the other time was in 1998, when they started 13–0 and won Super Bowl XXXIII. 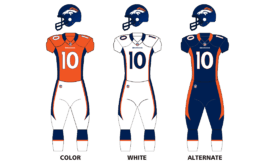 This was the first of two games in which the Broncos wore their alternate navy blue jerseys — the other game was Week 14 vs. the Oakland Raiders. This was the first game this season in which the Broncos' offense did not commit any turnovers. This was Bears' head coach John Fox's first game against the Broncos since mutually parting ways with the Broncos following the end of the 2014 season. It also marked Jay Cutler's first game against the Broncos, who drafted Cutler in the first round of the 2006 draft before he was traded to the Bears prior to the 2009 season. Cutler did not play when the Broncos and Bears last faced each in other in 2011 due to a thumb injury. The Broncos swept their division rivals on the road for the sixth time in seven seasons. With the win, coupled with the New England Patriots' loss to the Miami Dolphins earlier in the day, the Broncos clinched the AFC's No. 1 seed. A 38-yard field goal by Gostkowski was the only scoring play of the third quarter. The Broncos' offense went three-and-out on two of their three possessions of the third quarter. To begin the third quarter, the Broncos marched to the Patriots' 13-yard line, keyed by a 30-yard run by running back C. J. Anderson, but Manning overthrew wide receiver Jordan Norwood in the end zone on a third-down passing play. The Broncos had to settle on a 31-yard field goal by McManus to extend to a 20–12 lead with 10:06 remaining in the game. The Patriots marched down the field, and were facing a 4th-and-1 at the Broncos' 16-yard line with 6:06 remaining. However, instead of kicking a field goal, Brady threw a short pass to wide receiver Julian Edelman, who was tackled for 1-yard loss by cornerback Chris Harris, Jr. The Broncos were forced to punt on their next possession, and the Patriots once again drove deep into Broncos' territory, facing a 4th-and-6 with 2:25 remaining. However, the Patriots' turned the football over on downs once again, with Brady throwing an incomplete pass in the back of the end zone that was intended for tight end Rob Gronkowski, who was triple-covered by the Broncos' secondary. The Broncos' offense forced the Patriots to burn two of their three team timeouts prior to two-minute warning, but went three-and-out, giving the football back to the Patriots. The Patriots started their final offensive possession at midfield with 1:52 remaining. After Brady threw three consecutive incompletions, he connected with Gronkowski on a 40-yard pass on a 4th-and-10 play to deep the drive alive. With 17 seconds remaining, the Patriots were facing a 4th-and-goal at the Broncos' 4-yard line, and Brady found Gronkowski in the back of the end zone for a touchdown to narrow the Broncos' lead to 20–18. However, Broncos' cornerback Bradley Roby intercepted Brady on the potential game-tying two point conversion attempt. The Patriots' ensuing onside kick attempt was unsuccessful, sealing the win for the Broncos. 2015 season: Head coach Gary Kubiak tied a franchise record for wins by a first-year head coach with 12, a feat achieved by Red Miller in 1977. The Broncos became the fourth team in NFL history to reach eight Super Bowls, joining the Dallas Cowboys, New England Patriots and Pittsburgh Steelers. Week 5: Became the NFL's all-time leader in combined regular season and postseason passing yardage, surpassing Brett Favre. Week 8: Tied Brett Favre for the NFL's all-time record for regular season wins by a starting quarterback. Week 10: Became the NFL's all-time leader in regular season passing yardage, surpassing Brett Favre. Super Bowl 50: Became the oldest quarterback (39) to lead a team to the Super Bowl, as well as the first quarterback in NFL history to lead two different teams to multiple Super Bowl berths and wins. Manning led the Indianapolis Colts to Super Bowls XLI and XLIV — the former of which the Colts won, with Manning winning Most Valuable Player honors; he also led the Broncos to Super Bowl XLVIII (a loss) and won Super Bowl 50; became the oldest quarterback to win a Super Bowl, surpassing John Elway. At the time, Manning became the NFL's all-time leader in combined regular season and playoff wins (200), however, New England Patriots' quarterback Tom Brady tied that record in 2016. ↑ Legwold, Jeff (August 5, 2015). "Gary Kubiak: Broncos would be 'stupid' not to build offense to fit Peyton Manning". ESPN. Retrieved August 5, 2015. ↑ "Peyton Manning Career Statistics". pro-football-reference.com. January 26, 2016. Retrieved January 26, 2016. ↑ Brandt, Gil. "1985 Bears, 2015 Broncos among five best defenses of all time". NFL.com. Retrieved 4 May 2016. ↑ Klis, Mike (January 12, 2015). "John Fox, Denver Broncos part ways after playoff loss to Colts". The Denver Post. Retrieved January 12, 2015. ↑ Holden, Will (January 16, 2015). "Chicago Bears officially name John Fox new head coach". Fox 31 Denver. Retrieved January 16, 2015. ↑ Klis, Mike (January 16, 2015). "John Fox hired as Chicago Bears head coach: "I've been in places like this before"". The Denver Post. Retrieved January 16, 2015. 1 2 3 Klis, Mike (January 19, 2015). "Gary Kubiak adds Rick Dennison, Brian Pariani to Broncos' coaching staff". The Denver Post. Retrieved January 19, 2015. ↑ Wright, Michael C. (January 26, 2015). "Jay Rodgers joins Bears' staff". ESPN. Retrieved January 26, 2015. ↑ Klis, Mike (January 21, 2015). "Adam Gase joins John Fox with Bears as offensive coordinator". The Denver Post. Retrieved January 21, 2015. ↑ Wright, Michael C. (January 20, 2015). "Bears announce more coaching hires". ESPN. Retrieved January 20, 2015. ↑ Renck, Troy (January 22, 2015). "Strength coach Jason George to join John Fox in Chicago". The Denver Post. Retrieved January 22, 2015. ↑ Alper, Josh (January 26, 2015). "Bears hire another former Broncos assistant". NBC Sports. Retrieved January 26, 2015. ↑ Klis, Mike (January 14, 2015). "Jack Del Rio reaches agreement to become Raiders' head coach". The Denver Post. Retrieved January 14, 2015. ↑ Wilkening, Mike (January 19, 2015). "Eagles hire Cory Undlin as DBs coach, tab Justin Peelle as TEs coach". NBC Sports. Retrieved January 19, 2015. 1 2 Klis, Mike (January 26, 2015). "Broncos' linebackers coach Richard Smith leaves to join Falcons". The Denver Post. Retrieved January 26, 2015. ↑ Jhabvala, Nicki (January 20, 2015). "Gary Kubiak: Denver Broncos job was "a game-changer"". The Denver Post. Retrieved January 20, 2015. 1 2 "Broncos hire Fred Pagac as OLB coach, Tony Coaxum as assistant special teams coach". The Denver Post. February 10, 2015. Retrieved February 10, 2015. 1 2 Klis, Mike (January 20, 2015). "Joe DeCamillis hired as Broncos' special teams coordinator; Kubiak rounds out staff". The Denver Post. Retrieved January 20, 2015. ↑ Crabtree, Curtis (January 22, 2015). "Report: Texans D-line coach Bill Kollar to join Gary Kubiak in Denver". NBC Sports. Retrieved January 22, 2015. 1 2 Renck, Troy (February 13, 2015). "Gary Kubiak finalizes Broncos coaching staff with Marc Lubick, Samson Brown". The Denver Post. Retrieved February 13, 2015. 1 2 Klis, Mike (January 28, 2015). "Broncos hire Wade Phillips as defensive coordinator". The Denver Post. Retrieved January 28, 2015. ↑ Klis, Mike (February 27, 2015). "Jerry Butler, Broncos player development director, jumps to Chicago Bears". The Denver Post. Retrieved February 27, 2015. ↑ Klis, Mike (May 14, 2015). "Bears hire away Broncos executive Champ Kelly". KUSA Denver. Retrieved May 14, 2015. ↑ Klis, Mike (March 5, 2015). "Aaron Brewer, Broncos agree to four-year, $4 million contract". The Denver Post. Retrieved March 5, 2015. ↑ Klis, Mike (March 9, 2015). "Broncos tender restricted free agent cornerback Tony Carter". The Denver Post. Retrieved March 9, 2015. ↑ Renck, Troy (April 27, 2015). "CB Tony Carter signs tender contract, creates depth for Broncos". The Denver Post. Retrieved April 27, 2015. 1 2 3 4 5 6 7 8 9 10 11 12 13 14 15 Swanson, Ben (September 5, 2015). "Broncos make 22 roster moves to get 53-man roster". Denver Broncos. Retrieved September 5, 2015. 1 2 3 Renck, Troy (March 6, 2015). "Broncos tender contracts to Brandon Marshall, Ben Garland, Paul Cornick". The Denver Post. Retrieved March 6, 2015. ↑ "Paul Cornick, Jeremy Kelley waived by Denver Broncos". The Denver Post. May 4, 2015. Retrieved May 4, 2015. 1 2 Mason, Andrew (March 10, 2015). "Some Broncos move on as league year begins". Denver Broncos. Retrieved March 10, 2015. ↑ "S MOORE PLACED ON IR, WR HANKERSON WAIVED". Atlanta Falcons. December 15, 2015. Archived from the original on December 16, 2015. Retrieved December 15, 2015. ↑ Renck, Troy (March 10, 2015). "Tough-minded Virgil Green ready to "flourish" in Broncos offense". The Denver Post. Retrieved March 10, 2015. ↑ Klis, Mike (March 20, 2015). "Nate Irving leaves Broncos for 3-year deal with Indianapolis Colts". The Denver Post. Retrieved March 20, 2015. ↑ Klis, Mike (March 10, 2015). "Steven Johnson, Broncos agree to 1-year deal". The Denver Post. Retrieved March 10, 2015. 1 2 3 4 5 Jhabvala, Nicki (September 6, 2015). "Broncos claim C James Ferentz, TE Mitchell Henry; release Montee Ball, Gino Gradkowski". The Denver Post. Retrieved September 6, 2015. 1 2 Renck, Troy (March 12, 2015). "Terrance Knighton agrees to one-year, $4M deal with Washington". The Denver Post. Retrieved March 12, 2015. ↑ Wilkening, Mike (April 13, 2015). "Broncos re-sign LB Brandon Marshall". NBC Sports. Retrieved April 13, 2015. ↑ Renck, Troy (April 2, 2015). "Will Montgomery signs with Bears after Broncos sign Gino Gradkowski". The Denver Post. Retrieved April 2, 2015. ↑ Klis, Mike (March 12, 2015). "Rahim Moore reaches 3-year, $12M agreement with Texans". The Denver Post. Retrieved March 12, 2015. ↑ Klis, Mike (March 19, 2015). "Jacob Tamme signs two-year deal with Atlanta Falcons". The Denver Post. Retrieved March 19, 2015. ↑ Klis, Mike (March 2, 2015). "It's official: Broncos put franchise tag on Demaryius Thomas". The Denver Post. Retrieved March 2, 2015. ↑ Renck, Troy (July 15, 2015). "Demaryius Thomas agrees to 5-year, $70 million deal with Broncos". The Denver Post. Retrieved July 15, 2015. ↑ Klis, Mike (March 18, 2015). "Mitch Unrein signs 2-year, $1.9 million deal with Chargers". The Denver Post. Retrieved March 18, 2015. ↑ Sessler, Marc (November 9, 2015). "Wes Welker signs with St. Louis Rams". NFL.com. Retrieved November 9, 2015. 1 2 Wolfe, Cameron (October 17, 2015). "Broncos activate Kapri Bibbs, waive Richard Gordon". The Denver Post. Retrieved October 17, 2015. 1 2 Mason, Andrew (October 19, 2015). "Broncos bring back Richard Gordon; waive Kapri Bibbs to make room". Denver Broncos. Retrieved October 19, 2015. ↑ Mason, Andrew (October 21, 2015). "Broncos bring back Kapri Bibbs to practice squad". Denver Broncos. Retrieved October 21, 2015. 1 2 Renck, Troy (November 18, 2015). "Shelley Smith waived by Broncos to make room for Sam Brenner". The Denver Post. Retrieved November 18, 2015. 1 2 Renck, Troy (December 1, 2015). "Josh Bush signs with Denver, Broncos waive TE Richard Gordon". The Denver Post. Retrieved December 1, 2015. ↑ Renck, Troy (April 11, 2015). "Broncos agree to one-year deal with tight end James Casey". The Denver Post. Retrieved April 11, 2015. ↑ Jhabvala, Nicki; Renck, Troy (October 9, 2015). "James Casey released by Broncos to make room for Derek Wolfe". The Denver Post. Retrieved October 9, 2015. 1 2 Klis, Mike (March 10, 2015). "TE Owen Daniels agrees to 3-year, $12M deal with Broncos". The Denver Post. Retrieved March 10, 2015. ↑ Peters, David (March 10, 2015). "Report: Broncos sign TE Joe Don Duncan". CBS Sports. Retrieved March 10, 2015. 1 2 3 4 5 6 7 8 9 Jhabvala, Nicki (September 1, 2015). "Broncos waive three more to trim roster to 75 players". The Denver Post. Retrieved September 1, 2015. 1 2 Jhabvala, Nicki (August 6, 2015). "Karl Schmitz, punter, waived by Broncos; DT Sione Fua added". The Denver Post. Retrieved August 6, 2015. 1 2 Jhabvala, Nicki (October 14, 2015). "Denver Broncos sign TE Richard Gordon, waive Mitchell Henry". The Denver Post. Retrieved October 14, 2015. 1 2 Jhabvala, Nicki (August 10, 2015). "Broncos waive WR David Porter, claim OT Matt Hall". The Denver Post. Retrieved August 10, 2015. ↑ Renck, Troy (August 11, 2015). "Matt Hall elects to retire, leaving Broncos' roster at 89 players". The Denver Post. Retrieved August 11, 2015. 1 2 Jhabvala, Nicki (May 29, 2015). "Ryan Clady placed on injured reserve; Ryan Harris signed". The Denver Post. Retrieved May 29, 2015. 1 2 3 4 Renck, Troy (May 12, 2015). "Broncos claim WR Solomon Patton, TE Marcel Jensen off waivers; sign two undrafted rookies". CBS Sports. Retrieved May 12, 2015. 1 2 Renck, Troy (December 9, 2015). "Shiloh Keo signed by Broncos to provide depth in secondary". The Denver Post. Retrieved December 9, 2015. ↑ Jhabvala, Nicki (August 14, 2015). "Broncos claim veteran punter Spencer Lanning off waivers". The Denver Post. Retrieved August 14, 2015. 1 2 Jhabvala, Nicki (August 3, 2015). "Broncos place WR Kyle Williams (Achilles) on IR, sign Corbin Louks". The Denver Post. Retrieved August 3, 2015. ↑ "Pro Bowl guard Evan Mathis agrees to one-year contract with Broncos". The Denver Post. August 25, 2015. Retrieved August 25, 2015. 1 2 Renck, Troy (August 20, 2015). "Marvin Austin placed on season-ending IR; Broncos claim Jake Murphy". The Denver Post. Retrieved August 20, 2015. ↑ Jhabvala, Nicki (December 30, 2015). "Broncos sign rookie G Robert Myers off Ravens' practice squad". The Denver Post. Retrieved December 30, 2015. 1 2 Jhabvala, Nicki (August 28, 2015). "Solomon Patton waived by Broncos; Denver signs rookie TE Dan Light". The Denver Post. Retrieved August 28, 2015. ↑ Jhabvala, Nicki; Wolfe, Cameron (October 1, 2015). "Tyler Polumbus agrees to terms with Broncos; Josh Bush waived". The Denver Post. Retrieved October 1, 2015. 1 2 Renck, Troy (November 25, 2015). "Christian Ponder signs with Broncos to provide QB depth". The Denver Post. Retrieved November 25, 2015. 1 2 Renck, Troy (December 22, 2015). "David Bruton placed on IR; Broncos sign safety Shaun Prater". The Denver Post. Retrieved December 22, 2015. ↑ Mason, Andrew (December 29, 2015). "Broncos release Shaun Prater". Denver Broncos. Retrieved December 29, 2015. ↑ Renck, Troy (April 2, 2015). "DL Antonio Smith, Broncos agree to one-year contract". The Denver Post. Retrieved April 2, 2015. ↑ Klis, Mike (March 13, 2015). "Shelley Smith agrees to 2-year, $5.65M contract with Broncos". The Denver Post. Retrieved March 13, 2015. ↑ Klis, Mike (March 13, 2015). "Safety Darian Stewart, Broncos agree to two-year deal". The Denver Post. Retrieved March 13, 2015. ↑ Klis, Mike (March 19, 2015). "Reggie Walker signs with Broncos, adding to linebacker depth". The Denver Post. Retrieved March 19, 2015. ↑ Klis, Mike (March 12, 2015). "Broncos sign DE Vance Walker to two-year, $4M contract". The Denver Post. Retrieved March 12, 2015. ↑ Jhabvala, Nicki (August 26, 2015). "Connor Barth released by Broncos to make room for Evan Mathis". The Denver Post. Retrieved August 26, 2015. ↑ Renck, Troy (March 12, 2015). "Quanterus Smith waived by Denver Broncos". The Denver Post. Retrieved March 12, 2015. ↑ Renck, Troy (April 1, 2015). "Broncos acquire center Gino Gradkowski from Ravens". The Denver Post. Retrieved April 1, 2015. ↑ Swanson, Ben (June 1, 2015). "Shane Ray signs contract with Broncos". Denver Broncos. Retrieved June 1, 2015. 1 2 3 4 "Sambrailo and seventh-round picks sign their deals". Denver Broncos. May 15, 2015. Retrieved May 15, 2015. 1 2 Mason, Andrew (November 2, 2015). "Ty Sambrailo headed to injured reserve with shoulder injury". Denver Broncos. Retrieved November 2, 2015. ↑ Renck, Troy; Jhabvala, Nicki (May 9, 2015). "Jeff Heuerman's knee injury likely erases rookie year". The Denver Post. Retrieved May 9, 2015. 1 2 Renck, Troy (June 4, 2015). "Jeff Heuerman signs with Broncos, moves forward in recovery from surgery". The Denver Post. Retrieved June 4, 2015. 1 2 Jhabvala, Nicki (May 13, 2015). "Broncos sign draft picks Max Garcia, Darius Kilgo". The Denver Post. Retrieved May 13, 2015. ↑ "Lorenzo Doss signs his contract". Denver Broncos. May 14, 2015. Retrieved May 14, 2015. 1 2 3 4 5 Wolfe, Cameron (September 6, 2015). "Jordan Taylor, Taurean Nixon, Zaire Anderson make Broncos' practice squad". The Denver Post. Retrieved September 6, 2015. 1 2 Jhabvala, Nicki (January 19, 2016). "Omar Bolden to injured reserve; Broncos promote Taurean Nixon to active roster". The Denver Post. ↑ Swanson, Ben (March 25, 2015). "NFL revises Broncos' 2015 compensatory picks". Denver Broncos. Retrieved March 25, 2015. ↑ Caldwell, Gray (May 10, 2014). "Broncos Trade Out of Fourth Round". Denver Broncos. Retrieved May 10, 2014. ↑ Jhabvala, Nicki (April 30, 2015). "Broncos move to No. 23 in draft, take Missouri DE Shane Ray". The Denver Post. Retrieved April 30, 2015. ↑ Caldwell, Gray (May 9, 2014). "Denver Broncos Trade for Latimer in Draft's Second Round". Denver Broncos. Retrieved May 9, 2014. ↑ Swanson, Ben (May 2, 2015). "Broncos agree to terms with nine college free agents". Denver Broncos. Retrieved May 2, 2015. ↑ Mason, Andrew (September 5, 2015). "Broncos' undrafted streak ends after 11 seasons". Denver Broncos. Retrieved September 5, 2015. ↑ Jhabvala, Nicki (December 2, 2015). "Broncos re-sign TE Dan Light to practice squad". The Denver Post. Retrieved December 2, 2015. ↑ Jhabvala, Nicki (May 11, 2015). "In Antonio Smith, Broncos are landing a defensive leader". The Denver Post. Retrieved May 11, 2015. 1 2 Wolfe, Cameron (August 2, 2015). "Broncos sign rookie tackle Charles Sweeton, waive injured Connor Rains". The Denver Post. Retrieved August 2, 2015. ↑ Jhabvala, Nicki; Wolfe, Cameron (September 7, 2015). "Broncos finalize 10-man practice squad, sign RB Kapri Bibbs". The Denver Post. Retrieved September 7, 2015. ↑ Mason, Andrew (July 24, 2015). "Derek Wolfe suspended for violation of league policy". Denver Broncos. Retrieved July 24, 2015. ↑ Renck, Troy; Jhabvala, Nicki (September 3, 2015). "T.J. Ward suspended 1 game for violating NFL personal-conduct policy". The Denver Post. Retrieved September 3, 2015. 1 2 Renck, Troy (November 10, 2015). "Aqib Talib's appeal denied by NFL; will serve suspension vs. Chiefs". The Denver Post. Retrieved November 10, 2015. ↑ Wolfe, Cameron (August 1, 2015). "Kyle Williams ruptures Achilles' tendon at Broncos camp, says he's done for season". The Denver Post. Retrieved August 1, 2015. ↑ Jhabvala, Nicki (October 27, 2015). "Broncos release defensive tackle Marvin Austin from injured reserve". The Denver Post. Retrieved October 27, 2015. ↑ Renck, Troy (October 19, 2015). "Shane Ray to miss a few weeks from Broncos with MCL sprain". The Denver Post. Retrieved October 19, 2015. ↑ Mason, Andrew (November 18, 2015). "Broncos Injury Update: DeMarcus Ware, Emmanuel Sanders sidelined". Denver Broncos. Retrieved November 18, 2015. ↑ Renck, Troy (November 30, 2015). "T.J. Ward, Sly Williams expected to miss a week with injuries for Broncos". The Denver Post. Retrieved November 30, 2015. 1 2 Wolfe, Cameron (December 11, 2015). "Danny Trevathan, T.J. Ward out; C.J. Anderson iffy to play". The Denver Post. Retrieved December 11, 2015. 1 2 Jhabvala, Nicki (December 11, 2015). "Danny Trevathan, 3 safeties among Broncos' inactives vs. Raiders". The Denver Post. Retrieved December 11, 2015. ↑ Mason, Andrew (October 16, 2015). "Shaquil Barrett poised to make first career start for injured DeMarcus Ware". Denver Broncos. Retrieved October 16, 2015. ↑ Renck, Troy (November 16, 2015). "Explainer: Treatment, recovery time from torn plantar fascia". The Denver Post. Retrieved November 26, 2015. ↑ Renck, Troy (November 16, 2015). "Peyton Manning out vs. Chicago; Brock Osweiler to start". The Denver Post. Retrieved November 16, 2015. 1 2 3 Renck, Troy (January 3, 2016). "Peyton Manning, Broncos beat Chargers, earn top seed in AFC playoffs". The Denver Post. Retrieved January 3, 2016. 1 2 Renck, Troy (September 13, 2015). "Aqib Talib, defense carry Broncos to 19-13 win over Ravens". The Denver Post. Retrieved September 13, 2015. 1 2 3 Renck, Troy (September 17, 2015). "Peyton Manning, Broncos steal win from Chiefs late in Kansas City". The Denver Post. Retrieved September 17, 2015. 1 2 Renck, Troy (September 27, 2015). "Peyton Manning, Broncos beat Lions, improve to 3-0". The Denver Post. Retrieved September 27, 2015. 1 2 Renck, Troy (October 4, 2015). "Broncos defense holds off Vikings' late push, Denver wins 23-20". The Denver Post. Retrieved October 4, 2015. 1 2 3 Renck, Troy (October 11, 2015). "Chris Harris helps seal Broncos' victory at Oakland, 16-10". The Denver Post. Retrieved October 11, 2015. ↑ Durkin, Jimmy (October 11, 2015). "Broncos beat Raiders 16-10". San Jose Mercury News. Retrieved October 11, 2015. 1 2 3 4 Renck, Troy (October 18, 2015). "Peyton Manning, Broncos hang on to beat Browns in overtime". The Denver Post. Retrieved October 18, 2015. ↑ "Boxscore finder: Denver Broncos vs Cleveland Browns". pro-football-reference.com. October 18, 2015. Retrieved October 18, 2015. 1 2 3 Renck, Troy (November 1, 2015). "Broncos running game keys upset victory over Packers". The Denver Post. Retrieved November 1, 2015. ↑ Klis, Mike (July 23, 2014). "Pat Bowlen resigns control of Denver Broncos, acknowledges he is dealing with Alzheimer's disease". The Denver Post. Retrieved July 23, 2014. ↑ "Broncos stifle Packers' Aaron Rodgers, win battle of unbeatens". ESPN. November 1, 2015. Retrieved November 1, 2015. 1 2 Mason, Andrew (August 20, 2015). "Blue thunder: Broncos to break out blue jerseys against Packers, Raiders". Denver Broncos. Retrieved August 20, 2015. ↑ Renck, Troy (November 8, 2015). "Colts topple Broncos; Peyton Manning falls short of passing record". The Denver Post. Retrieved November 8, 2015. 1 2 Renck, Troy (November 15, 2015). "Gary Kubiak: I shouldn't have played Peyton Manning in loss to Chiefs". The Denver Post. Retrieved November 15, 2015. 1 2 3 Renck, Troy (November 22, 2015). "Brock Osweiler leads Broncos to win over Bears in starting debut". The Denver Post. Retrieved November 22, 2015. ↑ Raymond, Allie (November 22, 2015). "What They're Saying: Bears HC John Fox and QB Jay Cutler". Denver Broncos. Retrieved November 22, 2015. 1 2 3 Renck, Troy (November 29, 2015). "C.J. Anderson's 48-yard TD run caps Broncos' OT win over Patriots". The Denver Post. Retrieved November 29, 2015. ↑ Renck,Troy (December 6, 2015). "Broncos charge toward top seed with menacing defensive performance vs. Chargers". The Denver Post. Retrieved December 6, 2015. 1 2 Renck, Troy (December 13, 2015). "Raiders stun Broncos, shut out inept offense in second half". The Denver Post. Retrieved December 13, 2015. 1 2 Renck, Troy (December 20, 2015). "Brock Osweiler, Broncos collapse in second half in loss at Pittsburgh". The Denver Post. Retrieved December 20, 2015. 1 2 3 Renck, Troy (December 28, 2015). "Broncos clinch playoff spot, rally from 14 behind to beat Bengals in OT". The Denver Post. Retrieved December 28, 2015. 1 2 3 Renck, Troy (January 17, 2016). "Peyton Manning, Broncos beat Steelers, punch ticket to AFC championship game". The Denver Post. Retrieved January 17, 2016. ↑ "Denver Broncos Playoff History". pro-football-reference.com. January 17, 2016. Retrieved January 17, 2016. 1 2 3 Renck, Troy (January 24, 2016). "Broncos hold off Tom Brady and Patriots, head to Super Bowl". The Denver Post. Retrieved January 24, 2016. 1 2 Renck, Troy (February 7, 2016). "Von Miller, defense carry Broncos to Super Bowl 50 victory". The Denver Post. Retrieved February 7, 2016. ↑ Renck, Troy (March 7, 2016). "Peyton Manning retires from football: "I love the game...I will miss it."". The Denver Post. Retrieved March 7, 2016. ↑ "Denver Broncos Team Statistics". Denver Broncos. January 4, 2016. Retrieved January 4, 2016. NOTE: Search for the 2015 regular season. ↑ "NFL.com Statistics". NFL.com. January 4, 2016. Retrieved January 4, 2016. NOTE: Search for the 2015 regular season. ↑ "Denver Broncos Weekly Release" (PDF). NOTE: Search for page 5; the Broncos achieved this milestone with their Week 6 win over the Cleveland Browns. ↑ Stanley, Deb (January 24, 2016). "Denver Broncos, Peyton Manning going to Super Bowl 50". ABC Denver. Retrieved January 24, 2016. ↑ Vacchiano, Ralph (February 7, 2016). "Broncos defeat Panthers, 24-10, as Von Miller and 'D' help Peyton Manning in Super Bowl 50 victory". New York Daily News. Retrieved February 7, 2016. ↑ Swanson, Ben (September 17, 2015). "Peyton Manning passes 70,000 career passing yards". Denver Broncos. Retrieved September 17, 2015. ↑ "The Latest: Peyton Manning completes 6,000th pass". USA Today. September 28, 2015. Retrieved September 28, 2015. ↑ O'Connor, Ian (October 4, 2015). "O'Connor: A diminished Peyton Manning still stands between Patriots and Super Bowl". ESPN. Retrieved October 4, 2015. ↑ Nguyen, Joe (October 12, 2015). "Peyton Manning breaks combined NFL passing yards record". The Denver Post. Retrieved October 12, 2015. ↑ Legwold, Jeff (November 1, 2015). "Broncos clean things up, power past Packers with amped-up run game". ESPN. Retrieved November 1, 2015. ↑ "Manning Becomes Oldest QB To Lead His Team To A Super Bowl". CBS Denver. January 24, 2016. Retrieved January 24, 2016. ↑ Chappell, Mike (February 8, 2016). "Peyton Manning gets 2nd Super Bowl and 200th win, so was that his last rodeo?". Fox 59 Indianapolis. Retrieved February 7, 2016. ↑ Wolfe, Cameron; Jhabvala, Nicki (September 13, 2015). "Broncos' bests/worsts vs. Ravens: Brandon McManus and C.J. Anderson". The Denver Post. Retrieved September 13, 2015. ↑ Smith, Michael David (September 18, 2015). "Von Miller hits 50 sacks in 58th game, third-fastest ever". NBC Sports. Retrieved September 18, 2015. 1 2 Raymond, Allie (December 22, 2015). "Four Broncos selected for 2016 Pro Bowl". Denver Broncos. Retrieved December 22, 2015. ↑ Williamson, Christine (January 24, 2016). "Miller sets club playoff record". Denver Broncos. Retrieved January 24, 2016. 1 2 Wolfe, Cameron; Jhabvala, Nicki (January 3, 2016). "Broncos' bests/worsts vs. Chargers: Demaryius Thomas, offensive line". The Denver Post. Retrieved January 3, 2016. ↑ Swanson, Ben (December 2, 2015). "C.J. Anderson named AFC Offensive Player of the Week". Denver Broncos. Retrieved December 2, 2015. ↑ Swanson, Ben (December 2, 2015). "David Bruton Jr. named 2015 Broncos Walter Payton NFL Man of the Year". Denver Broncos. Retrieved December 2, 2015. ↑ "Ronnie Hillman named AFC Offensive Player of the Week for Week 17". Denver Broncos. January 6, 2016. Retrieved January 6, 2016. ↑ Raymond, Allie (October 29, 2015). "Brandon McManus named AFC Special Teams Player of the Month". Denver Broncos. Retrieved October 29, 2015. ↑ Gutierrez, Paul (February 8, 2016). "Broncos LB Von Miller named MVP of Super Bowl 50". ESPN. Retrieved February 8, 2016. ↑ Raymond, Allie (November 25, 2015). "Brock Osweiler named AFC Offensive Player of the Week". Denver Broncos. Retrieved November 25, 2015. ↑ Swanson, Ben (January 21, 2016). "Wade Phillips named PFWA Co-Assistant Coach of the Year". Denver Broncos. Retrieved January 21, 2016. ↑ "Aqib Talib named AFC Defensive Player of the Week". Denver Broncos. September 16, 2015. Retrieved September 16, 2015. ↑ Raymond, Allie (October 7, 2015). "T.J. Ward named AFC Defensive Player of the Week". Denver Broncos. Retrieved October 7, 2015. ↑ Raymond, Allie (October 1, 2015). "DeMarcus Ware named AFC Defensive Player of the Month". Denver Broncos. Retrieved October 1, 2015. ↑ Raymond, Allie (November 4, 2015). "Derek Wolfe named AFC Defensive Player of the Week". Denver Broncos. Retrieved November 4, 2015. ↑ Swanson, Ben (January 8, 2016). "Von Miller, Chris Harris Jr. named to All-Pro teams". Denver Broncos. Retrieved January 8, 2016. ↑ Klis, Mike (March 5, 2015). "Peyton Manning passes physical, making return to Broncos official". The Denver Post. Retrieved March 5, 2015. ↑ Mason, Andrew (March 8, 2016). "Broncos release Louis Vasquez, Owen Daniels and Aaron Brewer". Denver Broncos. Retrieved March 8, 2016.